After being turned over to new management, the St Mark Golf Course in San Marcos, Ca. 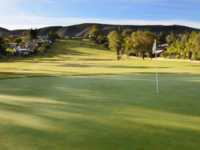 has become one of the best Lake San Marcos golf deals in the area. The course is located in the North San Diego County approximately 15 miles from Del Mar Racetrack in Del Mar, Ca. Master course architect Harry Rainville designed this course in 1963. The course is a regulation 18 hole, par 71 layout that covers 6,598 yards from the blue tees. The course has a slope of 129 with a course rating of 71.7. The course is set amongst mature, majestic trees forming tight fairways. The fairways are well manicure with several dog legs. The course has plenty of water hazards and sand traps to demand accuracy. The greens may well be some of the best in San Diego County. In order to take advantage of any St Mark Golf Course discounts, you can go online and make your Lake San Marcos tee times 7 days in advance. The driving range and practice facility will give you the chance to properly warmup. The course has available a nice pro shop, restaurant, club and cart rentals and banquet facility. The player are impressed with the recent changes in the course. The greens and fairways are excellent and the staff is very courteous and helpful.